The program provides individuals the opportunity to obtain a "Numismatic Scholar" certificate by completing a series of correspondence courses, hands-on seminars or a combination of the two. Students embark on an exciting and rewarding journey while acquiring the knowledge and skills necessary to appreciate and enjoy the hobby. The course, which features the updated “Grading U.S. 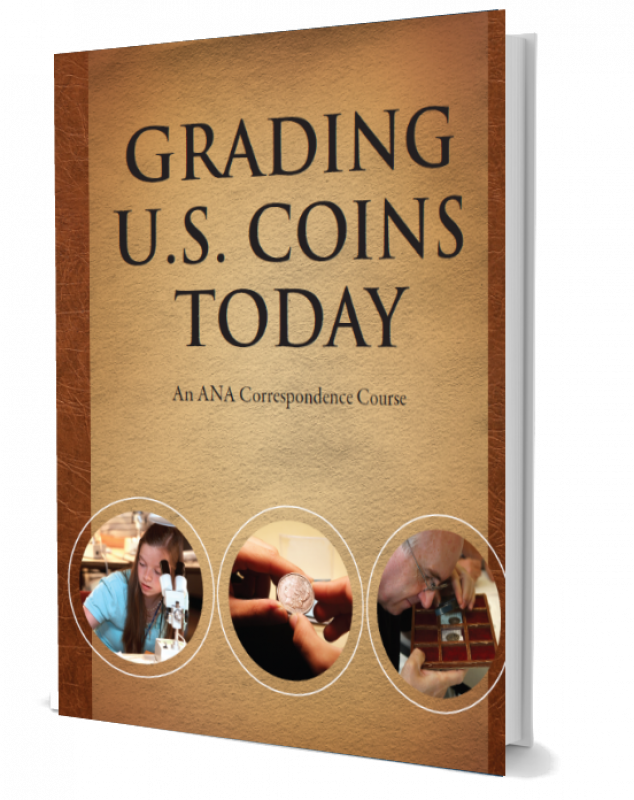 Coins Today” along with the 7th edition of “The Official Grading Standards for United States Coins,” is available to ANA members for $40.95. Non-members can order the course for $60.95, which includes both books and a one-year digital Gold membership to the ANA. "Detecting Counterfeit & Altered U.S. Coins"
"U.S. Minting Errors & Varieties"
"Grading Mint State U.S. Coins"
In-class courses may be used as substitutions for required courses. "The Complete Numismatist" or "Adventures in Numismatics"
"Introduction to Grading United States Coins"
"The Modern Minting Process and Errors & Varieties"
"Intermediate Grading of United States Coins"
At any time during the program, students can request a mentor to help answer numismatic related questions they may have while completing the program. All administrative questions, or inquiries about the tests, should be directed to the ANA Education Department. Below is a listing of student mentors who volunteer their time and numismatic knowledge to this program. Requirements for the Diploma Program consist of registration, the completion of six correspondence courses and a 200-question, closed-book final exam. Students can opt to take correspondence courses, classroom courses or a combination of both to complete the program requirements. Students should be able to complete the program within two years. If more time is needed due to illness, military deployment, etc., please make arrangements with the Education Department. Each student has the option of being assigned a mentor to answer numismatic-related questions while enrolled in the program. The courses can be completed in any order that the student wishes. Any required course that the student may have already completed within two years prior to registering for the program will count toward completion of the program. Students must successfully pass all individual tests for each correspondence course before applying to take the final exam. All students are required to be ANA members to complete the entire Diploma Program. The registration fee, final exam fee, 6 correspondence courses (5 books), Detecting Counterfeit and Altered U.S. Coins video and the Grading Mint-State U.S. Coins video are included in the $455 special offer. The final exam consists of an extensive 200-question written test covering information from all of the correspondence courses. This exam is to be administered by a proctor in any school, local library, at any ANA Convention, or at the ANA in Colorado Springs. If a student fails the final exam after two attempts, he/she will be withdrawn from the program and not be readmitted for one year. To register for the program, please call 719-482-9829 or email education@money.org. For more information or to order the program, please call (719) 482-9829 or email education@money.org.